First responders, including paramedics, police officers and firefighters, often make split-second decisions during emergencies. Because of this, the functionality of equipment used at the scene must be reliable, straightforward and sturdy. When it comes to handheld lighting, mainstream spotlights are not sufficient in meeting the needs of first responders and medical technicians. Unique features, such as a momentary switch and a rugged coiled cord, are critical to the success of emergency operations and must be present in such portable lamps. A momentary switch refers to a switch (usually a push button) that is activated only during engagement. The functionality of the switch is determined by its configuration: normally open or normally closed. In a normally open configuration, the switch is activated only when it is pressed in or down. A normally closed switch provides the opposite functionality, i.e. the light stays activated (on) until the button is pressed in or down. These types of switch configurations can be found in lights, elevators, keyboards, motors, appliances and industrial facilities. In spotlights, a momentary switch can be used for rapid toggling or signaling. For instance, an outdoor LED spotlight for hunting may include a momentary switch for emergency situations. A trapped or hurt hunter may use the feature to signal Morse Code with ease. In another example, a momentary switch can limit activation to only when the spotlight is really needed or in use. Such requirements could be for increased energy savings or the reduction of fire-related risks. In order to understand the significance of a momentary switch in spotlights, we must first look into the origin of this feature, in the context of ambulances and emergency services. The requirement of a momentary switch in spotlights used by first responders can be found in the US General Services Administration (GSA) Handbook (KKK-A-1822F, 2007). 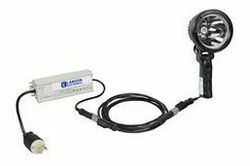 Momentary switches for handheld spotlights in ambulances are applicable to reducing fire risks. Leaving a light on for extended periods of time can increase the possibility of ignition, in unstable environments. This is highly applicable to emergency situations in flammable work sites or hazardous locations. The requirement of low voltage operation may decrease such risks. Additionally, the 100,000-candlepower standard may allow operators to illuminate potentially hazardous environments or targets from safe distances. The presence of a coiled cord could also prevent the operator from bringing the spotlight into the hazardous area, where it could become a source of ignition. Other lighting requirements specified by the document include floodlights, 75” above ground, around ambulances for illumination during loading and unloading. Mounting for external floodlights must be secured on the roofline. Switches for the fixtures can be located inside the cab, with automatic activation during rear loading (Flood and Loading Light, Exterior [3.8.3]). The GSA Handbook also provides lighting guidelines for strobe lights, illumination in patient compartments and interior spaces of ambulances. Portable spotlights with momentary switches are frequently toggled. Some lighting technologies, specifically LEDs, perform this function more reliably than traditional luminaries, such as halogen, HID and incandescent lamps. Focusing on HIDs, the units must be warmed up before reaching full illumination. Moreover, constant power cycling of the ballast could drastically reduce the spotlight’s intended lifespan. Incandescent lamps are prone to breakage, when exposed to rough contact and extreme environments, due to its fragile bulb. By comparison, LEDs last exponentially longer, with a lifespan of 50,000+ hours. For ambulance fleet operators, this may decrease costs related to maintenance and lamp replacement. As for the other lighting requirements set forth in Code “SL” Spotlight (3.15.4.1), LEDs are capable of superseding such GSA standards.